Stripping is a lot of work for any one. I have been stripping for years, layer by layer and it is tough work, no matter how much area you have to uncover. And no, I am not talking about stripping your clothes off, but glad I got your attention eh?..lol.. In short, I was raised a Roman Catholic, my Mother French, my father Ojibway. Two people who grew up in the same home town, the only difference was, my father was put in a residential school as a child and stripped of his being as he knew it, his language, his self confidence, his heritage, like it was all dirty laundry. I could and should write a book about life with Dad and maybe I will some day. Right now I am still learning so much about who he was, and who I am. One thing I know I am NOT, is catholic. I struggled with the confusion of what happened to my father, with praising a God, a religion that took the souls of innocent children. How can anyone praise such an act, done in the name of their God? There was this elderly couple that use to come and get me to go to church when I was about 7 or 8 years old. And they always told me the night before, do not eat breakfast before church! You are suppose to attend church on an empty stomach. Of course I wondered why but never asked for an answer. I got up early, got bathed and dressed always in a dress for church and waited to be picked up by the elderly friends of the family. Upon entering the church there was this odour, today I believe it was probably incense and there would be an alter boy lighting candles about the alter area before service. I sat about mid way in the room on a cold wooden straight back pew. There was no falling asleep here, that’s for sure but yet I wondered how some people did fall asleep about half way through a service, usually older gents. Between my 2 elders I was huddled, he would sent his hat on his lap, she her purse on her lap. Then I looked up at the alter, every Sunday, to the man, the statue on the cross, with painted blood dripping from the nail holes in his palms and atop his feet, blood running down his face from the thorn crown, these things done by man, who were apparently made in this God’s likeness. Why would they kill one of their own, crucify a son of a God? And each Sunday we who sat in the pews were told to ask for forgiveness for this act and that the God did forgive us for doing this to his son. Yet I felt guilty, for what we humans did. Then we are asked to drink his blood and eat his body during communion. Yes I knew it was watered down wine and pressed bread rings, but the fact still implanted in my brain, the guilt and the eating of his body and drinking of his blood. How horrific it was!!! for my little child brain. Argh. All this on an empty stomach!! 9 years ago, I started reading, more and more about religions and faith. I attended 3 different churches and boy that little confused girl was alive and well once again. So many questions, but this time, having to seek the true answers myself. In the past 7 years, I have been stripping all these childhood religious beliefs from my thought process and began to follow a pagan path, along with Wicca teachings and the culture of my heritage, my native heritage. There is still a long way to go and after talking to some, it is pretty much never ending. I am seeing just how magickal the world really is and beautiful with out the guilt and trauma imposed on children and adults through the catholic church. I don’t expect anyone to walk with me in my current beliefs and hope no one is expecting me to walk with them and their beliefs or that one is wrong and one is right. It is what it is. Its about finding inner peace with our beliefs and questioning everything. It is about pecking all the fruits and nuts off the top of a muffin, getting back to the basic then adding what ever flavour of icing you choose. After all, it is my own soul I am feeding and my souls palette is sensitive to all tastes at this point in my life. Memorial Day In The Great U S Of A! I am a day late, however it is never too late to praise the good! The soldier goes where his/her commander says to go. There is at times, comments made that have been twisted and fall into the wrong minds. Minds that provoke ignorance and disrespect against any person in the armed forces. There is a fine line between who we are and becoming what we actually are preaching against! I truly wish the COMMON MAN would stop re-writing the Bible to suit their agenda. May God Bless all soldiers who are serving and protecting ALL THE PEOPLES OF THE COUNTRY , from the presidents and prime ministers, all civilians and the first responders such as paramedics and police forces and even those that demean the soldiers duty! 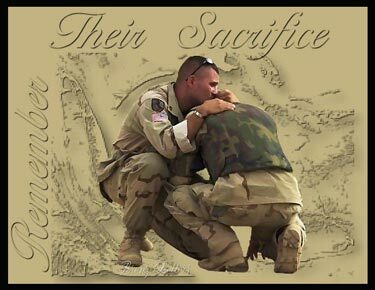 I know it is fact that any and all soldiers will be standing at the right hand side of God for putting their lives on the line to protect their fellow man, woman and child! – Amen!